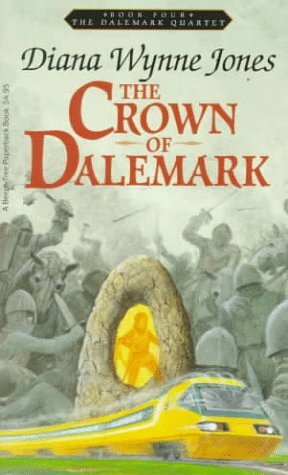 The first three books of the Dalemark Quartet by Diana Wynne Jones seem for all the world like they have nothing much to do with each other—until we finally get to Book Four, The Crown of Dalemark, which ties it all together. The funny thing is, it didn’t come along until twenty years after the third book. It makes me wonder if Jones had the fourth book in mind all along, or if she looked back at three slightly-connected books and decided to bring them together. The book opens with a return to a familiar character, Mitt, who in Drowned Ammet botched an assassination and escaped to the “free North” of Dalemark. Unfortunately, he now finds himself the victim of blackmailing by a northern Earl—his friends will suffer if he doesn’t assassinate Noreth, a noble girl who claims to be the daughter of the One, and plans to unite all of Dalemark. In the second section, we jump some two hundred years into the future, to a much more modern-feeling Dalemark, and meet Maewen. She happens to be the perfect image of Noreth. A magician(ish) sends her back to Mitt’s time, to take the place of the disappeared Noreth. With hazy ideas of how the history of the time is meant to turn out, Maewen tries to lead her small band of followers, including Mitt and Moril, the minstrel from Cart and Cwidder, to ride the “green roads” and unite Dalemark. But the ancient evil we met in The Spellcoats is stalking them, and someone in Maewen’s band is a traitor. I really wanted to love this book—and I ended up liking it, so that’s not really so bad. This is much longer than the first two books, and it has a much more sweeping, epic feel to it. We’re dealing with complex plots and significant events, and the fate of the country as well as the particular characters plainly hangs in the balance. I liked seeing the characters from the first two books join up here. There’s something satisfying about threads coming together, and Mitt in particular grew as a character when he was given a bigger scope to work in. I liked Maewen a lot too, both for the fun of seeing a modern character trying to cope with being in history (acutely aware of large-scale problems like changing the timeline, and small-scale ones like the lack of bathing!) and as a flawed but well-meaning and determined heroine trying to do her best in the circumstances. So where did I struggle? My favorite of the books is still The Spellcoats, and I didn’t feel it fit as neatly in as the other two books. The mythology of The Spellcoats and of Cart and Cwidder are not the same and yet they merge here, sometimes awkwardly. Although to be perfectly fair, I’m not sure if it’s actually inconsistent or if my memory is inconsistent (it’s complicated, and the names are long!) or how much of the issue was really me trying to put pieces together too soon (because I read these before, and I should be able to! Right? Wrong). I was also a bit bothered by the rather unconcerned dismissal of the real Noreth from the story, and the dismissal of Hildy as a worthwhile person. She’s a major figure in Drowned Ammet, where she is sometimes thoughtless but complicated—and she at least tries. Here she degenerates into a snobbish shrew. And then there’s the ending. Near the ending there’s a wonderful sequence determining who will receive the Crown of Dalemark, and a dramatic battle and unmasking of the traitor(s) and fight with the ancient enemy and it’s splendid. And I wish the book had ended there. Because unfortunately it’s followed by a somewhat shoehorned-in romance, a return to the modern day, and a much less satisfying second fight with said-ancient enemy. And that romance turns seriously squicky. You see, Maewen is thirteen (which creates an entirely different question of how she passes for eighteen-year-old Noreth, but never mind that…better nutrition in the modern day?) When she gets back into the present, her love interest is over 200 years old, and yes, he’s magical and presumably hasn’t aged much (that issue’s vague), but that does not change the fact that he got married and ruled a country during the intervening years. He tells her to wait four more years before looking him up again, but she’s not planning to, and that…is seriously squicky. It probably says something that, of all the things I forgot about this quartet, I remembered that particular detail vividly. We don’t actually know when Maewen next sees him, and you can make your own decisions about whether they did in fact wait four (or more) years, but if you read this, don’t say I didn’t warn you about the squickiness. Also, as an aside, I’m trying to make a conscious decision on cutting back for a while on how much time I spend on reading/commenting on blogs I love and follow, ’cause if I don’t, my own blogs will never be launched *sigh* I’m not disappearing…just fading for a bit with occasional apparitional appearances. I figure if I actually TELL everyone I’m doing this (that is, if you notice lol)—I actually WILL! You’re a very frequent commenter, so I would have noticed a disappearance. 🙂 Thanks for letting me know, good luck on your blogs, and hope to still see you around sometimes! Cheryl, thank you so much 🙂 I still haven’t focused on them due to interruptions and also having to focus on a couple fo submissions. But I’m getthing there! 🙂 Soon, I hope! What caught my attention in your review was your use of the word “squicky.” Is that a word?, I thought. I googled it (guess “googled” is now a word) and Google asked if I meant “squeaky.” When I confirmed that, no, I wanted to know about “squicky,” it took me to Urban Dictionary, which defined it as I pretty much figured out anyway – as something that makes one squeamish because of the ick factor in it. Colorful term that gets your point across. This makes me realize I don’t know where I picked up the word “squicky”! Possibly from other blogs… Squeamish about something icky sounds about right as a definition. It’s one of those words I find hard to define because there’s no real synonym–like “smarmy,” which I can only best define as “Peter Laurie’s character in Casablanca”! Excellent review, much of which chimes in with what I thought and remember (though it’s nearly time for a re-read of the whole quartet!). The ‘squickiness’ you talk of (squicky is a new word for me, but one I might well now use whenever appropriate) reminds me of Fire and Hemlock, especially when some reviewers find teenager Polly’s relationship with the adult Tom similarly squicky. Yeah…I found Polly and Tom a little squicky too! Which is unfortunate, because I so wanted to love that book–and I felt like that aspect of the plot was so much more central than the similar issue in Crown of Dalemark, it became much harder to get around. I think this fictional infatuation of a young girl with an older male must be a reflection of Diana’s falling instantly in love with John Burrow her future husband, who was certainly older than her and already at University. By then however she was waiting to go up to Oxford and so not anywhere near as young as Polly in ‘Fire and Hemlock’, though that definitely has an autobiographical flavour to it.